Whether you are looking for some privacy, a way to cover storage, or just a fun party theme idea, beaded curtains for doorways can accentuate any home. Utilizing these beautiful creations can help personalize and brighten any space. Beaded curtains are beautiful and decorative, although there are a few drawbacks to using them in your doorways. However, you should also consider the disadvantages of hanging a beaded curtain before committing to this look in a particular location. It does not block sound and only partially diffuses light coming through a doorway. It might easily become bothersome in a high-traffic area. Cats might find it an irresistible plaything and proceed to destroy it, while a dog might be frightened to pass through it. It is not safe for toddlers, who might become entangled in the strands or try to pull the beads off and eat them. Although almost any material suits this free-spirited decorating style, go for color. Metallic beads, iridescent glass or acrylic beads, rainbow curtains or colorful painted wood beads would all complement Bohemian style, which welcomes unconventional looks, wild patterns, and creative, artistic expression. 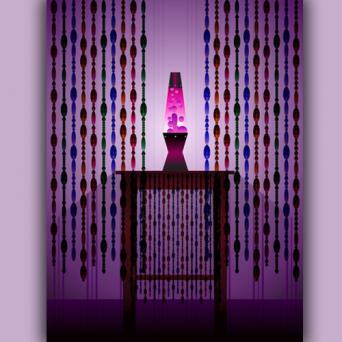 Any room decorated with 1960s or 1970s influences makes a perfect fit for door beads. Curtains made from natural materials were very common in this era, such as wood, bamboo and seashells. 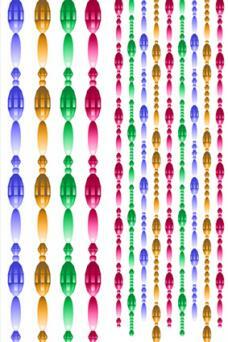 Macramé beaded curtains were also popular. Acrylic beads in various shapes and sizes in orange, green, red and blue made frequent door accents. Painted psychedelic motifs would work well in a retro room. Any type of beaded curtain works with eclectic style. Tie the curtain in with your decorating scheme by repeating an accent color or using a texture that complements the other décor. Hipster style is all about vintage and retro décor, so a beaded curtain is a natural fit. An authentic vintage curtain would be the premium choice of a hipster room, or perhaps a curtain made from re-purposed, thrift store jewelry. An eco-friendly bamboo curtain would also fit with the hipster lifestyle. Modern style rooms typically feature sleek, shiny surfaces, so choose door beads with a lot of shine and sparkle, such as metallic beads, glass beads and acrylic beads. Go for mirrored beads in shapes such as circles, squares, hoops, or bubbles. Look for curtains that form interesting, fluid patterns such as rain, or use a metal chain curtain for an industrial look. 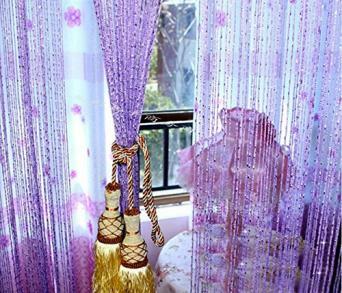 Since beaded curtains originated in Asia, they make perfect sense for this style. 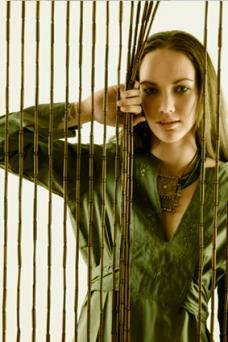 Bamboo is the bead material of choice, as it grows in many Asian countries. Asian inspired motifs are often painted on the curtains. 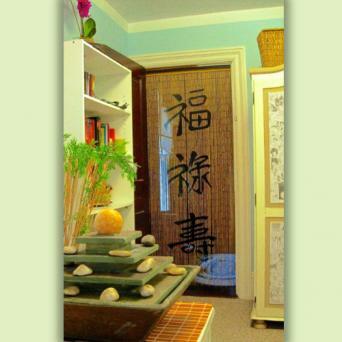 Use door beads made from natural materials to embellish a tropical or beach inspired room. Bamboo, wood, coconut shell or seashell beaded curtains make lovely accents and you can often find painted tropical motifs on wood or bamboo curtains. Curtains made with silk leaves complement a tropical room, while blue or green beaded bubbles would make a fun accent in a beach inspired setting. 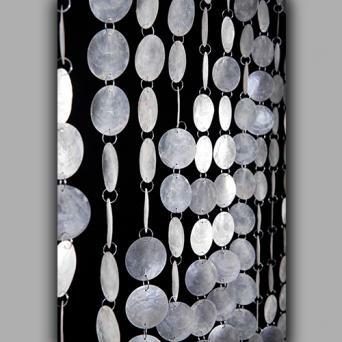 ShopWildThings - Find hundreds of different beaded curtains made from acrylic, bamboo, wood, PVC, seashells, mirrors, silk leaves, and metal chains. Painted curtains feature motifs such as tropical, Asian, psychedelic, floral, animals, and the American flag. 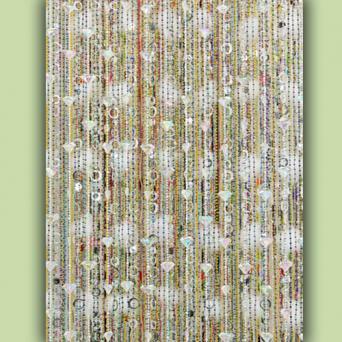 The Bohemian Girls - The beaded curtains here are categorized by color and are made from acrylic and faux pearl beads. They offer extra-long beaded curtains ranging, from eight feet to 30 feet long and also offer curtains made from feathers. eBay - This is a good resource for finding vintage beaded curtains. Other search categories offered include bamboo, clear, crystal, wood, and glass. Etsy - If you're looking for something unique, this is a good place to find handmade, one-of-a-kind beaded curtains you won't find anywhere else, made from a wide variety of materials. Lou Rideou Provencal Boxwood Bead Curtains - These lovely, made-to-order wood beaded curtains are made in France. These are true, artisan home accents made by a handful of French craftsmen. It will take a minimum of two months to produce the curtain once it is ordered. While beaded curtains are available for sale in a multitude of colors, styles and materials, there are some occasions when you may wish to make your own. Curtains that are only to be hung temporarily for a party or curtains for non-standard sized doorways can be easily made at home. Divide the curtain rod into sections 1/2" to 1" apart, depending on how many strands of beads you'd like and the size of the beads. Screw the eye hooks in at regular intervals. Tie the ends of your bead strands to the eye hook for a secure and permanent placement. Beaded curtains can be made in any style or pattern, so try experimenting with pairing different beads together. Some beads are cut to touch one another and fit together nicely on a strand, while others may require you to tie a small knot between each bead. If you aren't sure which look will work best, try purchasing just a few beads to try hanging them from a thread in different ways before purchasing and assembling the curtain. 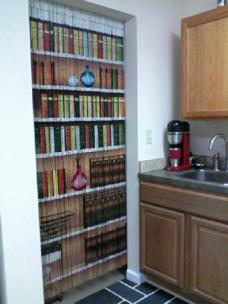 Beaded curtains for doorways can provide a casual, elegant, or thematic touch to any space. Pull colors and materials for the beads from the surroundings in the room; homes with a great deal of wood work, for example, may be complemented by a curtain made of wooden beads. Accent colors can also be pulled from throw rugs and cushions, so let your home be your guide. 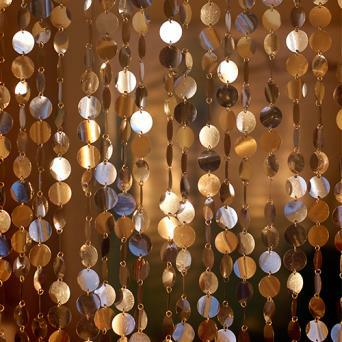 Use a beaded curtain in any area of the home and give the room a personal and decorative touch.